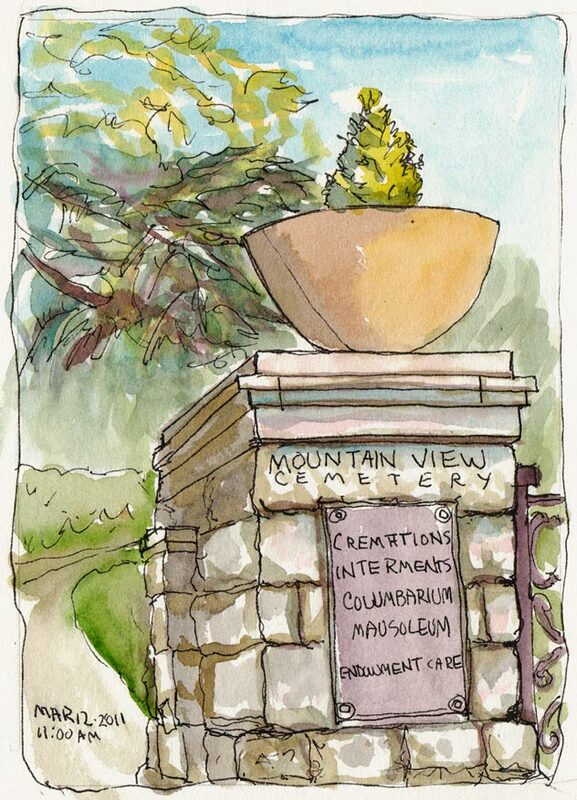 I had planned to oil paint with my plein air group at Mountain View Cemetery but there were just too many interesting sights to explore to plant myself in one spot with an easel. I switched to ink and watercolor which is so much more portable. I wonder what the statue above is supposed to be pointing towards? The entrance and central plaza is planted with thousands (?) of tulips. I hoped they would be in bloom but I only spotted one early bird. This cemetery is such a beautiful and historic place (as you can see in this photo slide show). 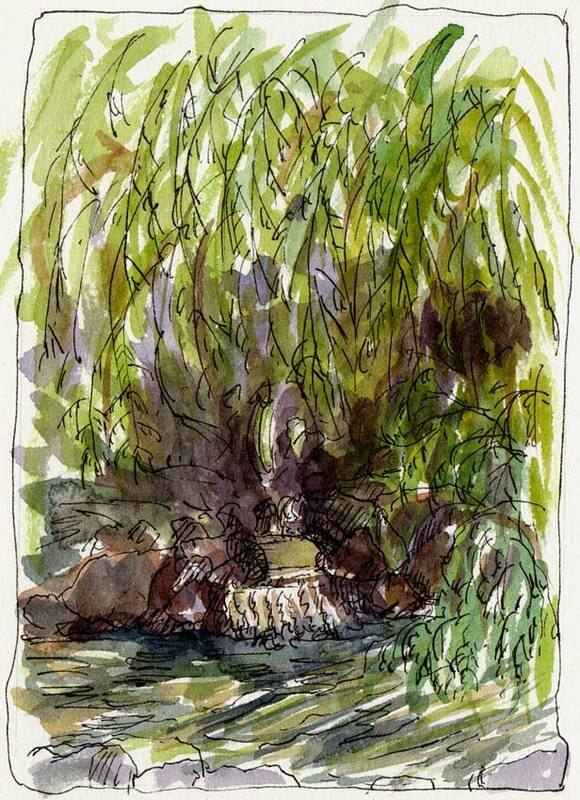 This pond and little waterfall beneath a gigantic weeping willow tree (above) is one of my favorite spots in the cemetery, hidden just behind the entrance gate. I’ve tried to paint it before and have yet to get it right. Maybe next time. After the group left I stayed behind to draw a couple more of the statues. The life-sized angel on the left was bunching up her robes, looking off into the distance. The one on the right is yet another female statue pointing at something in the distance. I’m curious about how people chose or designed their statues in the 1800s. Were they built to order or were there standard designs they could buy? Why are they almost all women? I suppose in death, like birth, a mother watching over us is comforting, even if she’s looking or pointing at something else. far back do you think these headstones go? 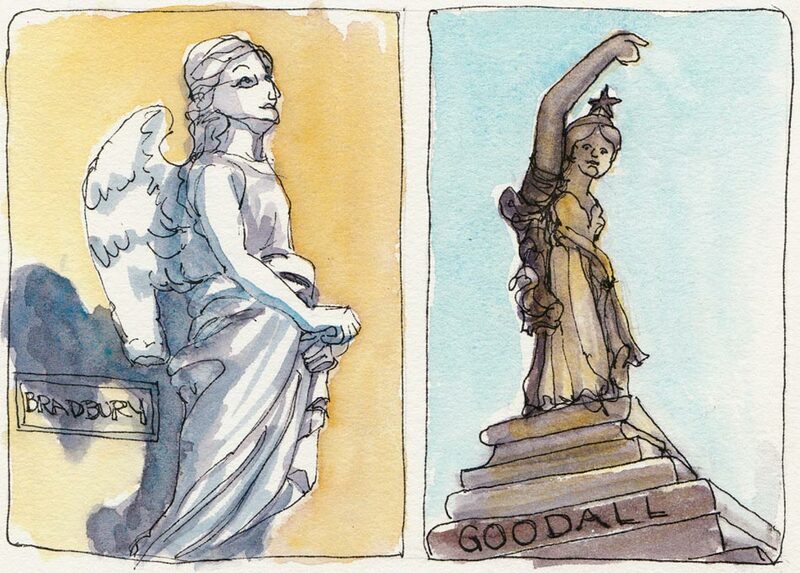 Love the watercolors and your interesting sketch site. Fabulous sketches!!!! Great attention grabbing post title too. My mom is buried nearby is a small, peaceful, pretty cemetery nearby. I go there often to pray and have tried a time or two to sketch (in Spring especially, the trees and shrubs are so colorful). I like to go there for the quiet, but on even the rainiest or snowiest days, someone else always comes by, which interrupts my “vibe”. What a world–no true solitude, even in a cemetery! Best of luck in finding some. angels or respect for the dead.A green lawn with some gravestones. What a beautiful place, and you offer, as well, insightful commentary about the ways art (sculpture) depicts ineffable and mysterious things. I do like your heading – Lively day etc. What a lively place or you worked so hard leaping between rocks and hard places. It’s certainly a place for producing an array of drawings. Statues posing and so on. And no neighbours making comments ha ha. You made the place interesting but not creepy. 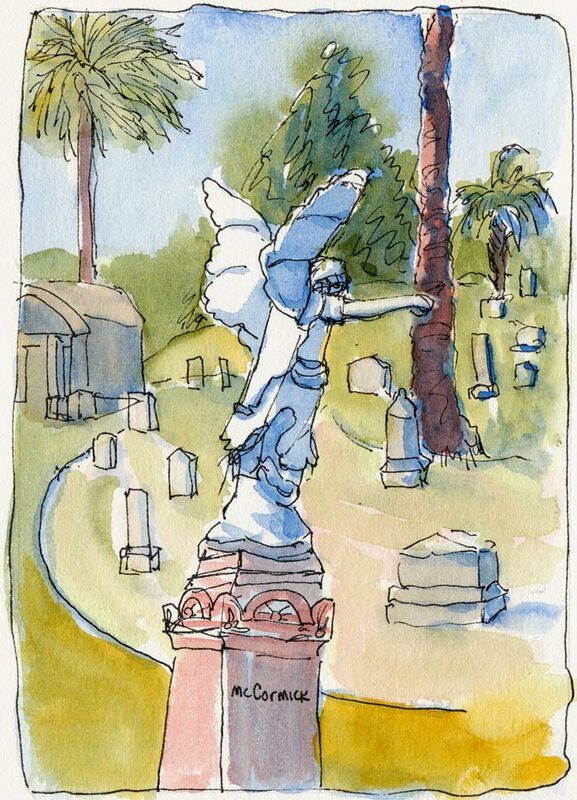 I do like drawing in cemeteries, but sometimes friends and family tease me because they think it is creepy. I especially love the colors in the statue that is pointing.